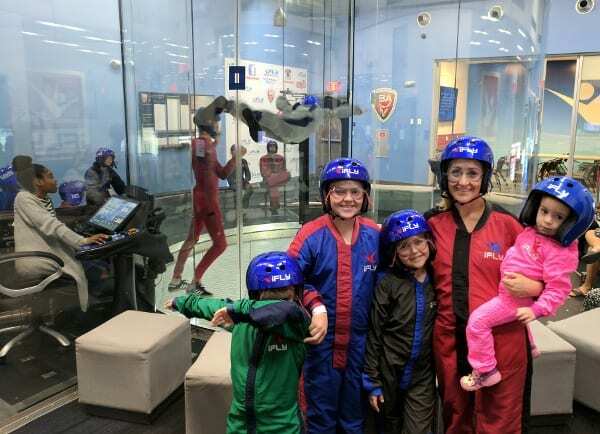 Home»All»Take the Kids Skydiving… at iFly Houston – Memorial! 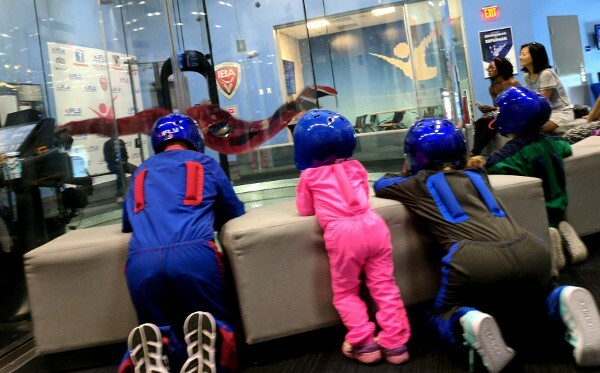 Take the Kids Skydiving… at iFly Houston – Memorial! My youngest son has kept on his bracelet all week and told everyone we met about iFly Houston! 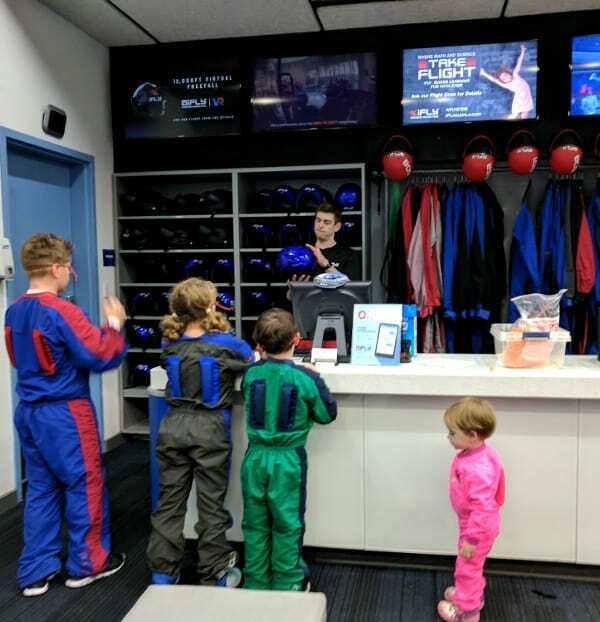 iFly invited us out for a flight and the kids could not have been more excited. They have been asking to go for years… and finally they got their chance! Our iFly flight was schedule for a weekday at noon. We arrived, signed the waivers and headed up the stairs to find the giant glass chamber where people were flying! We watch several people fly before we got started, so we had some idea what we were able to do. Each flyer went in with the instructor. He stood on the ground and held the suit as the person flew. He gave instructions through hand signals and if the flyer was straight enough, they could fly on their own. And at the end, the instructor would fly and put on a show for everyone watching! Soon after, the kids were in the flight chamber waiting room (and I was outside with baby… and switched with my big boy later on). One by one they went in and flew! They each had two minutes… but in the wind, it did feel like much longer. 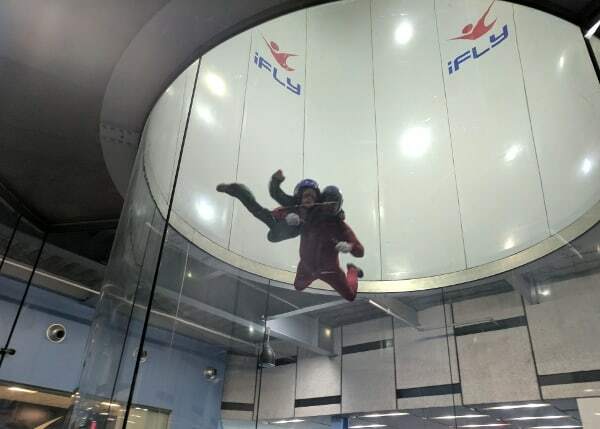 We had the high flying package, so at the end, the instructor actually took his feet off the ground and flew up high with the kids! Watch the video! The kids (6, 9 and 11) thought this was the greatest experience and declared they wanted to come back for Flight School. Watching them was not at all scary because the instructors were doing a great job and the kids were happy. There was another little girl in our group (about 5 years old) that was scared after her first flight. She wanted to quit before her second trip in, but with the mom’s permission, the instructor encouraged her, got her to try again and held her very close for another flight. I was really impressed that they were so caring. I did take my flight… and let me tell you that I am scared of most everything, including heights and small spaces. Once inside, the height was really no big deal and the space was plenty big enough. It was the giant gusts of wind on my face that I found hard to handle! For the first few seconds of my flight I was wondering how I would be able to survive for the minute… but in the end, I was glad I did it! Kids 3 and older can fly. You need to wear closed toe shoes. A flight suit, goggles, ear plugs and helmet are provided. Small lockers are available for free. In the flight chamber, one person is adjusting the giant fan. They work with the instructor (and I assume they adjust it based on your size and how high they want you to go). To start the flight, you just lean into the wind and float up. At the end, the instructor takes you to the exit, you grab on and pull your legs out. The instructor stands on the mesh ground, with the giant gusts of wind coming from the floor. The flyer floats in the air and tries to keep their body straight and chin up. If you have a high flight at the end, an instructor actually flies up with you and brings you back down. If you fall in love with flying, you can join Flight School. We have not been, but accoring to Houston mom Hilary, you get more flying time and practice skills (like going up, down and spinning). 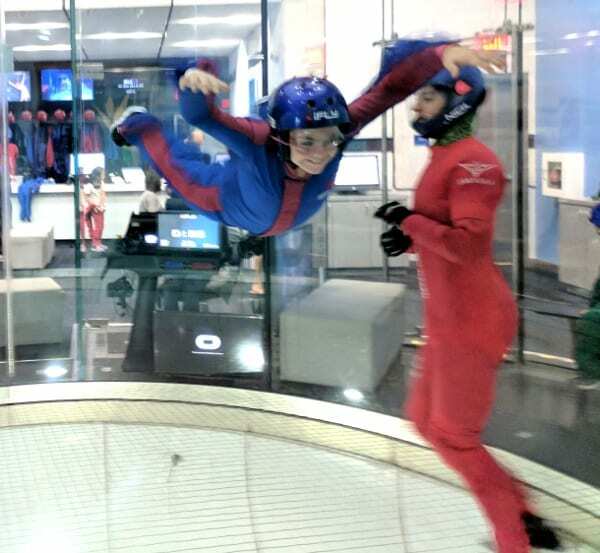 If you want to learn more about iFly, go HERE! Things to Do in Houston, with Kids… Posts on BigKidSmallCity, Published June 16-22, 2018!